And it's a milestone birthday. Today, I turn 40. Oh my gosh that sounds so old when it's written in black and white. It's crazy, because I certainly don't feel forty. In fact, I have never felt my age. (If you know me, you'll also know I don't always act it either). I'm of the opinion that just because one grows older, it doesn't mean one has to be defined by it. In the 40 years I've been on this earth, I've done so many incredible things. I learned to tie my shoes and blow a bubble gum bubble at four years old. I learned to ride a bike when I was five and totally smashed my face up in the process. I was a super fast runner, despite the fact I was heavier than most kids my age. I was made fun of for being the tallest kid in my class from second grade until sixth grade (developing earlier than most girls my age didn't help matters either), but it honed my wicked sense of humour. I was saved by the grace of God when I was 13. I fell in love for the first time with a boy I thought I couldn't live without at 15. He broke my heart at 16 and he broke my heart again when he passed away at 21. I had a lively social life through high school while holding down three jobs. I graduated high school with flying colours. I bought my first brand new car at 20 and my first home when I was 21, despite the fact it was practically a shed. It was small, but it was mine. I met another boy who flipped my world upside down and stole my heart when I was 24. He promised me the world and I married him three years later. He continues to find new ways to show me that world. I sold my home, quit my job, and left everything I've ever known and moved to another country at 26. I became a mother at 30 and again at 34, which is my greatest achievement of all. I became a sponsor mother to three children from three different countries. I've had six jobs in my life and I've really enjoyed (and learned something from) them all. I went back to school and became a culinary student at 39. I've traveled the world at different points in my life, visited 15 countries, been to almost all the US states, and met so many amazing people while doing so. Of course, with the good also comes the bad. I endured icky parts of life such as watching my parents get divorced when I was 16 and having loved ones I thought would live forever pass away, like my Grandma who was the most incredible person I've ever known. I've watched my Mother overcome adversity after adversity, yet somehow find strength to get through it. I've outgrown friendships and friendships that have outgrown me. I've shed many, many tears and I've had my heart broken more times than I care to admit. These experiences, both good and bad, have made me who I am today. I took the heartaches and learned lessons just like I took the good times and shared the joy. I also learned how very important it is to praise God in the hallway while waiting for the next door to open. All I'm trying to say is birthdays should never be seen as a pain or nuisance; they are a privilege. It's life's way of marking moments and milestones as an individual, but resetting with each passing year, hopefully making one wiser and stronger with each. This is why I feel it's important to own who you are and take comfort in knowing you're doing the best you can with what you've been given. Age is just a number and life is short. You only get one chance to live, so live it and live it well. Make it count. Take risks. Celebrate! 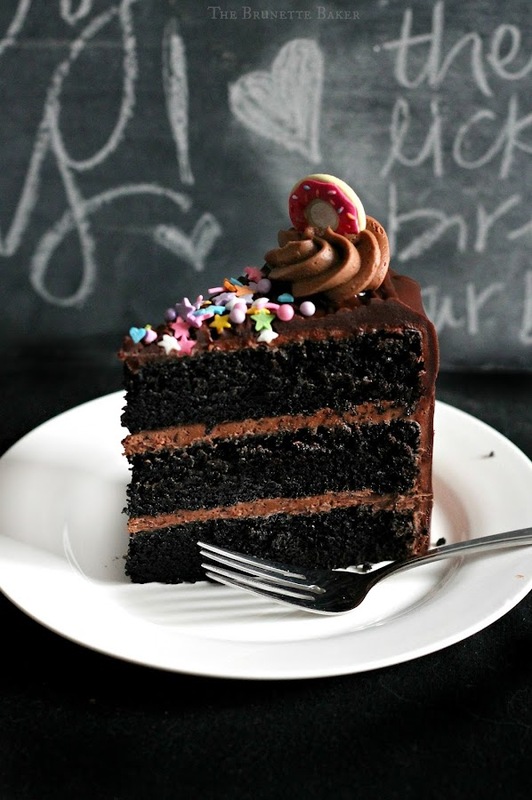 And be sure to stuff your face with chocolate cake every now and again, birthday or not. It's so good for the soul. *If you can't find black cocoa, use Dutch-processed and add a few drops of black food colouring into the mix. Preheat oven to 350 degrees F. Prepare three nine-inch cake tins by greasing pans with butter and lining with parchment paper disks. You can also use a professional baking spray. In a mixing bowl, whisk together flour, baking powder, baking soda, cocoa, and salt. In a separate mixing bowl, using an electric mixer, beat together butter, sugar, and vanilla extract on medium speed for two minutes. Add eggs, one at a time, and beat until blended with each addition. Slowly add in flour mixture, alternating in turns with buttermilk, until all ingredients are fully incorporated. Evenly pour batter into prepared cake tins. Give the pans a few gentle taps on the counter to release any air bubbles. Place in oven and bake for 20-25 minutes. Cake is done when it's pulled away from sides and a toothpick inserted comes out clean or with a few moist crumbs. Remove from oven and allow to cool for several minutes before turning out and allowing to fully cool on a wire rack. Once cake is completely cooled, frost with buttercream. In a heat proof container, melt chocolate in microwave in 30 second intervals. Stir. Once chocolate is creamy and lump-free, set aside to slightly cool. In a mixing bowl, using an electric mixer, cream butter on low speed for one minute. Turn off mixer and add in powdered sugar slowly. Pour in heavy cream and vanilla. Beat all ingredients on low speed until frosting comes together. Pour in melted chocolate and continue to beat on low speed until fully incorporated. (In case you are wondering, low speed prevents too many air bubbles in your final product and will yield a smoother frosting). Spread frosting over bottom top layer. Add second tier. Spread frosting on top of cake. Layer with third tier. Apply frosting to top and sides, covering entire surface of cake. Once fully frosted, prepare chocolate pouring sauce. In a heatproof container, melt chocolate in micorwave in 30 second intervals. Once creamy and lump-free, stir in butter until fully incorporated. Add in corn syrup and still well. Pour over top of cake. Using an offset spatula, begin to edge close to outer rim and allow to drip over sides. Don't fiddle with it too much as it sets quite quickly. 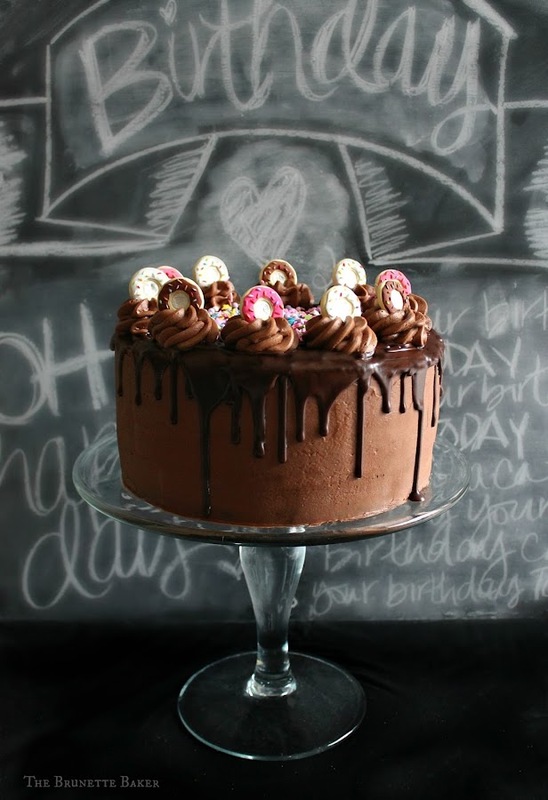 Once fully set, add embellishments and pipe fun frosting shapes, if you so desire. I love you so damn much. Happiest of birthdays! HAPPY FREAKIN' BIRTHDAY JENNYYYYY!!!!! You are one truly amazing human being, and I am honoured to call you my friend! Happy Birthday Jenny! I enjoyed reading your post. It was sentimental yet thought provoking. I also had a major milestone birthday last year. You're right, we should celebrate our life every day. Enjoy your beautiful cake. Happy birthday! I love learning more about you-you've definitely been through a lot in your 40 years, but all in all-it sounds like it's been amazing! 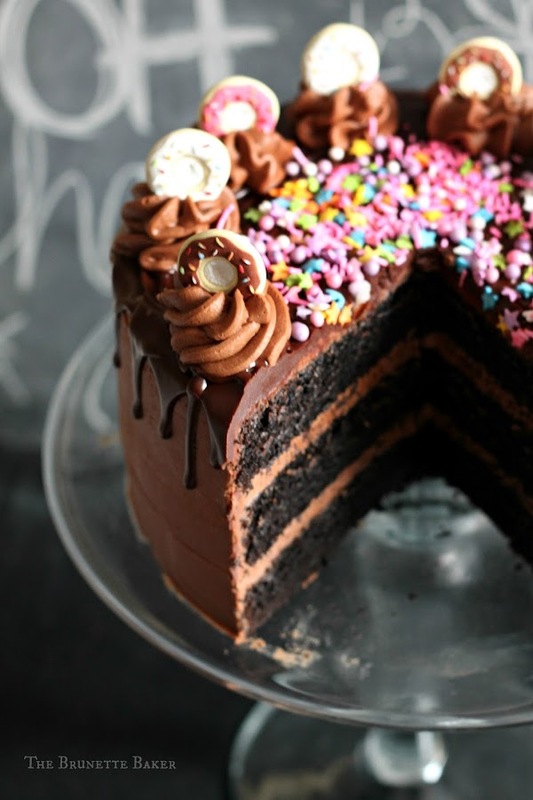 Just like this cake-which looks perfect and incredible and SO SO chocolatey! Happy Birthday Darlin!! Thinking about you! And your sweet smile. The cake is flawless! Absolute perfection. You are talented...and purdy! Xo! -Ashley & Kurt tooooo! Where did those doughnuts comenmfrom? !